online learning communities such as BBS or SL friends groups. learning and meet their need s in this ever changing wo rld. 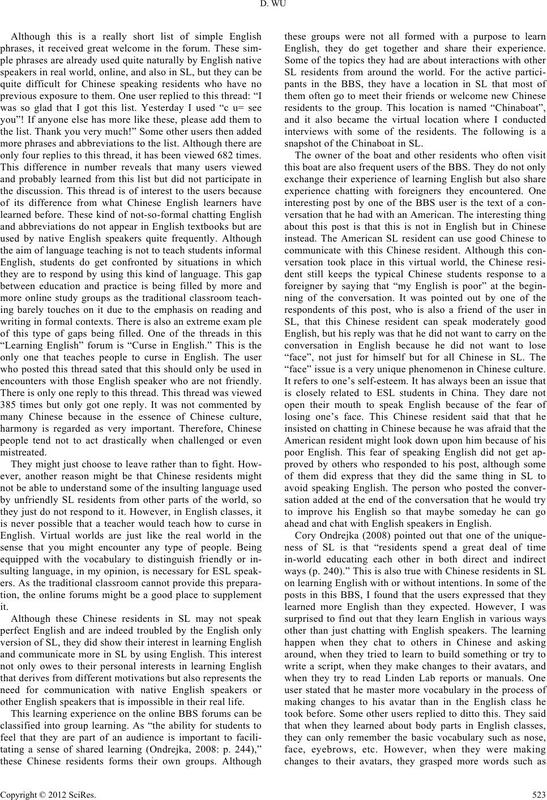 ESL professional s are also include d in this paper. the total residents in this virtual world has reached 16 million. ting different levels and kinds of English proficiency tests. learning clubs that meet regularly online or offline or both. focus on communication abilitie s.
“Chinese Second Life League” BBS www.CNSecondlife.com . lish” and will later be extende d to other forums. the English content s in other forums. residents themselves to support and help other residents. but also critiqued and commented on. 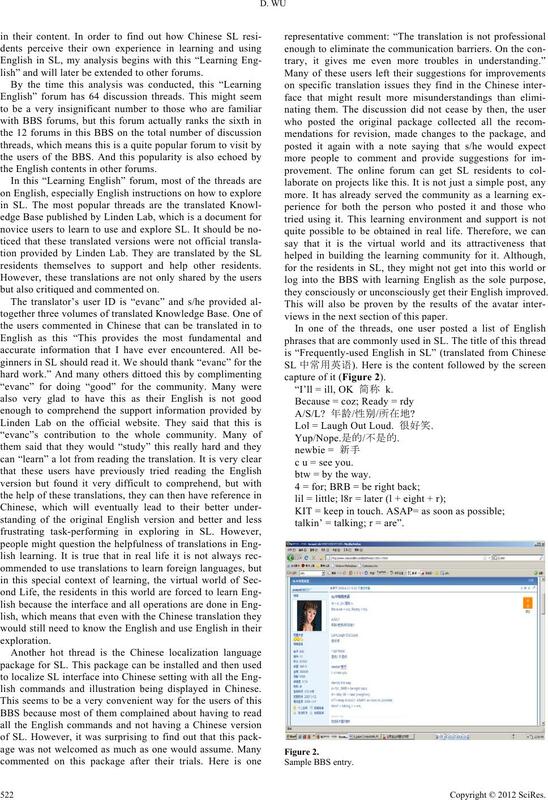 lish commands and illustration being displayed in Chinese. they consciously or unconsciously get their English improved. views in the next sectio n of this paper. capture of it (Figure 2). “I’ll = ill, OK 简称 k.
Lol = Laugh Out Loud. 很好笑. c u = see you. btw = by the way . talkin’ = talking; r = are”. only four replies to this thread, it has been viewe d 682 times. encounters with those English speaker who are not friendly. other English speakers that is impossible in their real life. English, they do get together and share their experience. snapshot of the Chinaboat in SL. “face” issue is a very unique phenomenon in Chinese culture. ahead and chat with Engli sh speakers i n English. some Chinese residents in SL. sion, sharing of r esources, and excha nge of informati on. 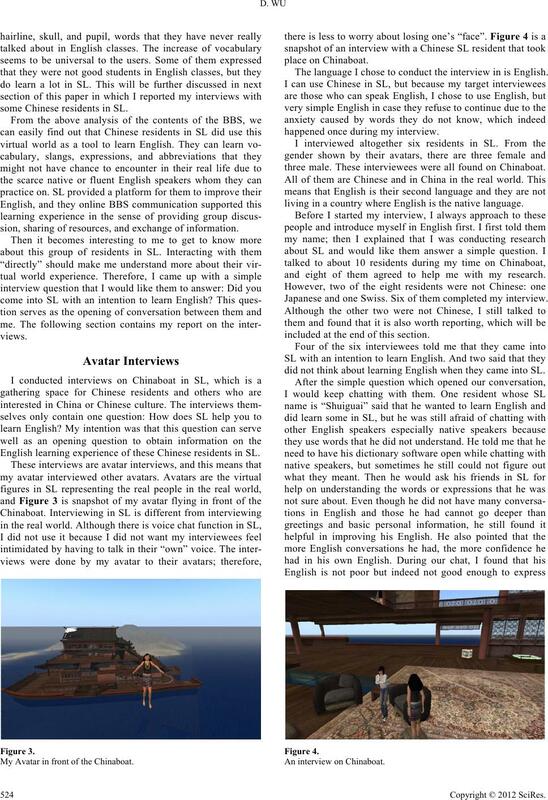 English learning ex perience of the se Chinese residents in SL. My Avatar in front of the Chi n a b o a t .
The language I chose to conduct t he interview in is English. happened once during my interview. three male. These interviewees were all found on Chinaboat. living in a country whe re English i s the native language. and eight of them agreed to help me with my research. Japanese and one Swiss. Six of them completed my interview. included at the end of t his section. did not think about learning English when they came into SL. An interview on Chinabo at. speakers which was almost i mpossible for hi m in real life. rather turn to electronic dictionary or their friends for help. This echoes the existence and popularity of the BBS forums. she did not come in with an intention t o improve her English. good English, and it is very difficult t o understand t hem. afraid of responding slowly and making mistakes. do not make stupid mistakes. cannot get improved by just practicing with their classmates. In the online BBS, there are also “Shui guai”s and “Berry”s. they can easily get daunt ed by “Berry”s’ En glish proficiency. the hunger for practice among Chine se English learne rs. to improve their English or at lea st attempt to do so. condition cannot fulfill this hunger for English proficiency. ing this new technolo gy into our classes. “face” issue and get the assistance they nee d.
that would have a computer lad dedicated to the course. down the incorporation of virtual worlds into ESL education. virtual worlds like SL into their classrooms. Be patient. It is the same as in the traditional classroom. other English spea kers that were once impo ssible. This study only provides an initial look into this issue. (12W41) for the grants and support provided for this project. Atkinson, T. (2008). Second Life for educators: Myths and realities. guage and Intercultural Co mm u n i c a t ion, 8, 101- 118.
nese mainland. System, 35, 259-270.
sessment trio. Educational Media International, 45, 157-176. 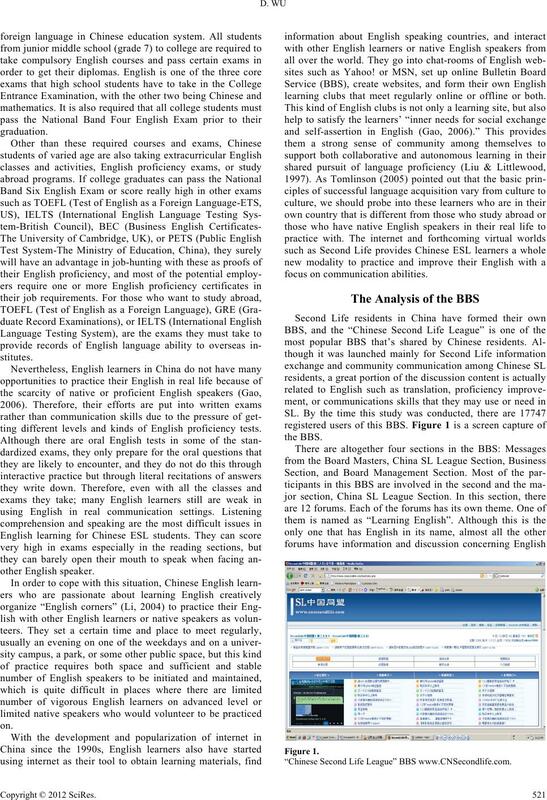 Foreign Language Teaching and Research Press. bridge: The MIT Pre ss. search in second language teaching and learning (pp. 137-153). Hoboken, NJ: Lawrenc e Erlbaum.